Studies show that being around dogs can help relax and calm people in as little as 10 minutes. So, it’s no wonder that people suffering from anxiety and depression commonly use dogs as emotional support animals. 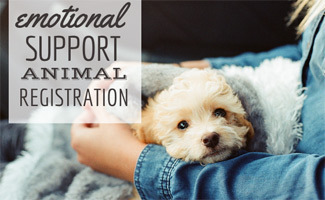 Find out how to accurately obtain emotional support animal documentation and provide proof that your condition requires the need for an animal when renting a home or traveling. What Are Emotional Support Dogs Requirements? There is no training required for an emotional support dog. A dog trained to “ground” a person with a psychiatric disorder does work or performs a task that would qualify it as a service animal.” Any dog can be an emotional support animal (ESA) without any training. The dog has to provide comfort to the person it is assisting. Unfortunately, you may see some ESAs that aren’t the most well-behaved because there are no requirements. How Does The ADA Look At ESAs? Emotional support animals are not considered service animals under the Americans with Disabilities Act (ADA). ESAs provide comfort to a person by being with them. However, since ESAs have not been trained to perform a specific job, they do not qualify as service animals under the law. Some states have laws that allow people to have their ESAs with them in public. It’s important to check local government offices to know what laws are in your area. Can A Landlord Deny My ESA? The Fair Housing Act (FHA) prohibits the discrimination in housing because of many things, including disability. Under this Act, landlords cannot deny tenants who use animals for assistance, to perform tasks or provide emotional support. Additionally, it is illegal for landlords to charge extra fees to those who have an ESA. Please know that a landlord can request documentation from a qualified physician, psychiatrist or other mental health professional establishing the disability and the need for the ESA. Unfortunately, many people abuse the need for an ESA to try and get into “no pet” housing by stating their dog is an ESA. This isn’t fair to those who genuinely require an ESA. It’s also why landlords often request documentation of disabilities. You can read up on some recent FHA cases regarding reasonable accommodations. Can I Fly With My Emotional Support Dog? According to the U.S. Department of Transportation, ESAs are allowed in the cabin portion of an airplane that is flying within the United States. Airlines can request documentation for ESAs 48 hours in advance before allowing the pet in the cabin area. However, if the animal is too large to fit in the cabin (or over 20 pounds), the airline may not allow it. Additionally, if the pet poses a direct threat to the health of other passengers, it may be excluded. If you are traveling outside of the U.S., foreign airlines are only required to accept dogs. Your destination country must also permit the dog to enter. This is something you’ll want to research ahead of time. If you feel your rights are being violated under the Air Carrier Access Act, you should ask to speak with a Complaints Resolution Officer (CRO). A CRO is an expert on disability accommodation disputes. It is a requirement for all airlines to have one available to you at no cost. Do You Have To Register An Emotional Support Animal? No, ESAs don’t require registration. Unfortunately, there are many websites online that say if you pay a fee your dog will be a registered ESA and listed in a database. However, this database doesn’t hold much real value since landlords and airlines can still require a letter from a medical professional stating your disability. There is no certification requirement. 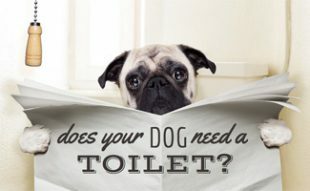 You’re basically paying a one-time fee for a letter from a medical professional stating your need for an emotional support animal (assuming you meet the pre-screening requirements). This letter holds no value unless it is from a licensed medical professional (either through an online service or from your mental health professional). It isn’t a requirement that you have your dog clearly marked as an ESA, but it may prevent some questions as to why you have an animal in a place that does not normally allow dogs. Identifying your dog as an ESA can also help prevent people from petting the dog without asking you first. Additionally, a dog wearing an ESA vest may aid in easier travel requirements. The vest we’ve linked to above is available in multiple sizes. It’s high quality and has a 1-year guarantee. The harness has “Emotional Support” clearly marked to prevent any confusion. If you have an emotional condition, speak with a mental health professional about the potential benefits of an ESA. The doctor or counselor will be able to tell you what characteristics to look for in an ESA, so you adopt the best fit for you. Be sure to obtain an ESA letter from a mental health professional. You’ll need this should a landlord ask, or when airlines require documentation. If you don’t have the time to meet in person with a mental health professional, you can obtain an ESA letter from one of the websites listed below. There are dozens of sites out there but feel these are your two best options. Note: online services require a mental health pre-screening questionnaire to determine if you qualify for an ESA (similar to what a mental health professional would ask prior to issuing you a letter). 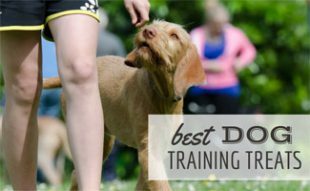 These three types of working dogs are all different, so don’t confuse them with one another. 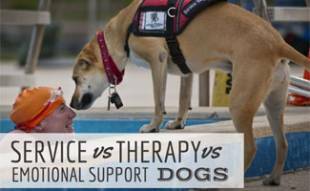 If you want to know how the training, certification and use of these different dogs varies, read our Service Dog vs Therapy Dog vs Emotional Support Dog article. Additionally, being around a dog frequently can boost your health in many different ways. Have you ever had your ESA accommodation request denied? Thanks for sharing a great article with us. Thanks for letting me know that emotional support animals don’t require any training. I’m going to be moving out to college, and I suffer from pretty severe anxiety. My dog helps to calm me down, so maybe I should get her registered as an ESA so I can take her with me.